Direct Importer of Japanese and European cars from Japan. Access to Japanese Auctions. Calculator - compare cost Japan Vs. NZ. Importing services including Vehicle Compliance­. Only $17 to apply online. Nationwide­. Phone and email communicat­ion. Car carrier ship stops in all major ports in NZ: Auckland-W­ellington-Nelson-Napier, Christchur­ch-Dunedin. Most of cars starting from years 2004 onward can imported. Some European cars only from year 2006. Diesel from 2008 onward. We are buying cars directly from Japanese Auctions. To find out auction price and compare it to NZ price, please subscribe to the Auction Access. You can match a right car to your budget using our Sales Statistics and Importing Calculator. We have more tools like Educational Videos and How to Place a Bid manuals - all available after you sign up for the Auction Access. Auction Access allows you to view all cars in Japan exactly in the same way like car dealers view them. Find the car you like, and we buy it for you right from the Japanese Auction. When successful - we arrange importing and compliance etc. This approach will save your time and make importing easy. 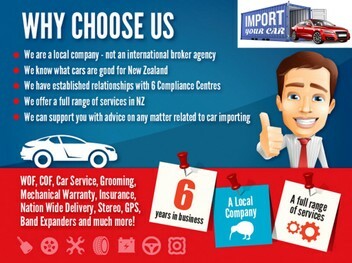 We know what cars are good to import, and recommend you cars which will pass NZ Compliance. Our priority is to buy a car within your budget or for less. Is takes around 1 to1.5 month to import a car from Japan. We will keep you informed about every step. We take care of the whole process from start to the end. We have imported over 3000 cars. So you can count on us. Our Importing fee is $800 gst included. $17 is for the Auction Access, to show that you are serious about importing. We've checked and our fees and rates are cheaper by $1000 comparing to other importers! Exchange rate and compliance are two variable costs. Car is insured during shipment. It's safe, fast and rewarding. We have inside knowledge of finding best cars available. We keep you updated during all importing process. Please inquire at our web-site and call us if you are seriously considering importing your next car from Japan. EXCELLENT. Can't recommend highly enough. I was kept fully informed throughout the whole process. Have to say I was very nervous handing over my hard earned money to a stranger....then waiting....I needn't have worried at all. Car arrived...better than expected 5 weeks later. I will only import in future if buying another car. THANK YOU. Highly recommended; these guys know what they are doing. Car was in better shape than i expected. Import was easy, but be prepared to wait about two months between purchase of the car and actually driving it. My next car will definitely come from Alex and NIck again! Thanks so much 10/10 for everything. Highly Recommend. Was a pleasure dealing with you guys. Absolutely happy with the purchase and the whole process. Alex worked very hard bidding for multiple vehicles on my behalf for more than a month until we got the desired result for the right price. My next car will definitely be through you guys. Sachin. Hi Team, Pleased with the car & the service you have provided. I can comfortably get 70k's of mostly open road driving 2 up with golf gear aboard with a 9 bar battery. It would be good if the auction sheets showed the battery status on electric cars as this is an important part of their condition. Also would probably be good if you put on your main website that you require a deposit before bidding, & why you require it, as it is not till the client wants to bid that it is mentioned. Very pleased with our imported car and the service offered by Import Your Car. Very helpful, good advice and good communication throughout. Importing a car wasn't something we had considered until recently as it seemed such an unknown process and a bit of a gamble. These guys made it really easy and we're really glad we imported. Thank you guys for your great service, helped to import a good car, and save heaps of money, definitely will deal again. We got a really great car from this crew and we are very very happy that we used their team. The car was nicer than we expected from the auction sheet which shows how meticulous they are. Overall- Inspection and report 10/10 Ease of process 9/10 Communication 8/10 Actual car (Volvo C30) 10/10 Overall Yes we will definitely recommend this team! Thank you very mush. Great job! We imported our car from Japan and Alex and team helped us all the way. Very professional and highly recommended. Very happy with the advice and service we received. I recommended them to all my family and friends. Full 5 stars. Very nice and helpful service, saved a lot! Bought my car (Toyota Passo) from Alex and Nick and really loved the car. Alex is very helpful in answering all my inquiries before purchasing the car and Nick kept me up-to-date with the status of the car as well as pictures in the port. The car runs smoothly and I'm very satisfied with the purchase. Will definitely get my next car from them! Really appreciate how easy this process was with the help and advice given for the car I was looking to import. The Toyota Vitz I received was a very tidy little car (auction grade 4) and am very happy with it. Thanks so much, will definitely be in contact to do the same again in the future. I am so glad that we used Ultimate motors. The car that we have ended up with is way nicer than we thought that we could ever own. I will definitely use Alex next time I want to buy a car. Our Volvo C30 came with a spare key, a full service record and a 300 page manual. The car itself (grade 4) is mint, apart from a minute little scatchy thing which is difficult to spot and largely irrelevant. Alex's review of the car was spot on. Again I wish to thank the team and highly recommend them. I was looking for a used VW Touran in NZ and I discovered that I can save more by importing. Japanese auctions gave me more to choose from, and with my budget I could find Tourans with less mileage or later model years than what I found in NZ. Even before I got in touch with the team, the importer's site has already given me a lot of information about importing. The team is reliable and offers very helpful recommendations throughout the process. Alex: Thanks a lot Rex, it was a good deal! Importing an unseen car through an online service can be quite a daunting proposition. Nick was absolutely amazing in providing a professional door to door service that was very efficient indeed. I didn't have to worry about a thing - just received my sparkling, unique vehicle here in NZ and am thoroughly enjoying it. The auction sheet was also very accurate in describing the car - all round, nothing to worry about. I would recommend Nick's service entirely without reservation. Many thanks. Nick: Thank you very much. Lawrence from Wellington imported 2014 Toyota Crown Majesta Hybrid. It was a rare car and took time to find and buy. More info at our Facebook page. Thanks. Importing a car from another country without even having a chance to see it in person is always a risk. However, I had a successful experience buying my new car with the help of Nick. The whole process of choosing a car, bidding, shipping, compliance and registration took about 2 months. Nick was helpful with his communication and made the entire process very smooth and easy. The car arrived in better condition than described and is currently running smoothly without any faults. Nick: Thank you Young. We have imported Lexus IS350 for him.